Here we are in September 2010 and despite constant reassurance coming from officials in India, the Commonwealth games are not, and will not, be ready for the opening next week. Speculation has been rife for months as sources have continually leaked information to the media, suggesting that it’s highly unlikely India will be prepared to host the games which are due to commence on the 3rd of October. Sadly, this week the speculation has turned factual, with a series of events that highlight just how unprepared this country really is. The situation is dire, the games are in doubt and ultimately, India have failed miserably. The week from hell started on Sunday 19th September when two Taiwanese tourists were brutally shot in what appeared to be a random attack of terror by two Indian men riding motorbikes outside the Jama Masjid Mosque, just a short drive from downtown Delhi. This came just hours after concerns were raised as to the increasing likelihood of terror attacks occurring during the games. It has been reported that one risk assessment firm has suggested that there is an eighty percent chance of an attack occurring during the games, with another firm suggesting the chance is fifty percent. Either way, it’s a risk that our athletes shouldn’t be taking. If this wasn’t enough to put concerns and doubts into the minds of the athletes, officials and spectators, the events of the next two days surely would have. It all started on Tuesday 21st September when the New Zealand chef de mission, David Currie, expressed his concerns over New Zealand’s accommodation for the two week period of the games. He claims the accommodation was, “Not up to scratch,” and that he’d held discussions with New Zealand Prime Minister, John Kelly, who went as far as saying, “There is no point sending the athletes to the Commonwealth Games in Delhi.” The New Zealand Olympic Committee has since stated that they will have a decision by Friday as to whether or not they’ll send athletes to the games. 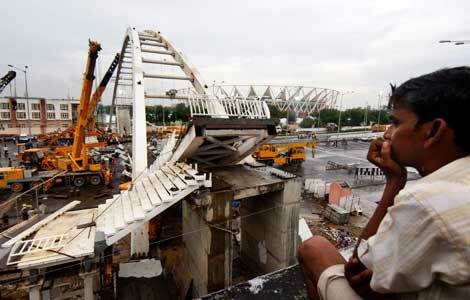 In the other major event of the day, a footbridge just a few hundred meters from the Jawaharlal Nehru stadium collapsed and injured almost thirty people, five of which seriously. The footbridge to the games main stadium, which has previously been plagued by delayed construction, gave way while many labourers were working frantically to get the structure fixed in time before the athletes arrive next week. Four remain in critical condition with doctors stating there are no signs of improvement. The timing of these events couldn’t be worse for India, a country which has successfully held a number of large scale sporting events, predominantly cricket, in recent years. In addition to these successful events, the country of over a billion people has been experiencing a rapid expansion in economic growth and had recently been touted by many economists as a the boom country of the next decade. With large amounts of human and natural resources, in 2008 India was the world’s second fastest growing major economy and was predicted to be amongst the leading economies in the world by 2020. Holding the 2010 Commonwealth Games in Delhi was meant to be an opportunity to showcase the countries development over recent years and to confirm their place as a potential super-power of the global economy. However sadly, the events of the last week have done nothing but ruin this reputation and hinder the good work of many people. If the trend continues, investors will lose faith in the Indian market and they risk falling off the radar for a number of years. After taking so many steps forward over the last decade, it’s such a shame that they could end up taking just as many back. Essendon Football Club’s record of 44 wins, 2 draws and 81 losses in their past 127 games is a disaster. They have played in just 1 finals match since 2004 which resulted in a 96 point defeat at the hands of the Adelaide Crows. Recent thumpings by Geelong, Adelaide, Melbourne and West Coast have seen the club slump to one of its lowest points in their proud, 139 year history. The article below highlights just where things went wrong. The once mighty Essendon Football Club has given me a lot of joy throughout my lifetime, none more so that the flags in 1985, 1993 and 2000. During this time, along with all other Essendon members, I’ve come to expect a great deal of success both on and off the field. This stems from such a proud and successful history which has yielded a record (shared with arch-rival Carlton) 16 Premierships from 30 Grand Final appearances. However, due to this long-term success and a recent history of poor drafting and poor development of the younger players, Essendon now finds itself in arguably the lowest point in the clubs history. Currently languishing down the bottom end of the AFL Ladder, Essendon have gone from a competitive record of 5 & 5, to a wooden spoon chance of 5 & 11. Obviously injuries to key players such as David Hille and Tayte Pears, along with the recent suspension of champion veteran Dustin Fletcher, have played a part in the clubs recent demise, however even with the inclusion of these three stars, the results are unlikely to have changed a great deal. Questions are being raised as to the ability of coach Matthew Knights and his future must be in serious doubt. After 27 years of Essendon’s favourite son Kevin Sheedy, the shoes were always going to be hard to fill and after a finals spot last season, things were looking up. However, merely 10 months on, Knights’ head is well and truly on the chopping block. Of course there is only so much a coach can do and if his players aren’t performing, then he can not be blamed. However, serious questions linger over the style of game he’s asking his players to perform while even bigger questions remain over the selection, or non-selection of promising young players at Bomberland such as Jake Melksham, Brent Prismall and Bachar Houli. While these three players, comfortably in Essendon’s best 22, are fighting a losing battle at Bendigo, other less competent players such as Michael Quinn (the silly Irish git), Henry Slattery (Essendon’s most hated player) and Ben Howlett are being picked to play most weeks. In regards to the exciting brand of football Knights is asking his players to produce, despite this being successful in 2009, things have changed which require a re-assessment of the game plan. In 2009 Essendon had two champion forwards in Scott Lucas and Matthew Lloyd who provided a target for the mid-fielders if the ball was moved down the field quickly. This year however they aren’t there given their recent retirement. The result of this is Essendon rebounding out of the defensive 50 and reaching the mid-field and wondering what to do next. Given the confusion, they hold onto the ball, stuff around with it in desperation to find a target and ultimately turn it over. This is reducing entries into the forward 50 and reducing the shots on goal being taken. The other negative of this is the rebounding ball into Essendon’s defensive half is putting the backline under immense pressure and ultimately resulting in more scoring shots for the opposition. On a more positive note, there are promising signs throughout the mid-field and defensive half with young players such as Heath Hocking, Nathan Lovett-Murray and Angus Monfries linking well at times with experienced players such as Dustin Flethcher, Jobe Watson and Brett Stanton. There are exciting young forwards in Leroy Jetta, David Zaharakis and Alwyn Davey who are full of excitement, however still lacking in consistency. There are also promising signs from talls Michael Hurley, Jay Neagle and Scott Gumbleton however like their small forward counterparts, they are lacking in consistency. Another area which is causing some concern is the poor performances from two key experienced players in Mark McVeigh and Andrew Welsh. Both of these blokes have been at the club for close to, or over a decade and really need to show some leadership, which is not beyond them. Welsh needs to concentrate on his football and not his clothing business or his hairstyle. The form which saw him average 20 disposals a game in 2006 has vanished and has been replaced by a player lacking the courage and desire to run out in the red and black each week. McVeigh, also famous for his hair care is looking very slow and questions must be asked whether he has fully recovered from his recent hamstring troubles of the past few seasons. He’s approaching 30 now and is half the player now as he was when he came runner-up in the Critchton Medal in 2007. Jason Laycock (2002, #10) – Just 58 lacklustre games in 8 injury-prone seasons. Darren Walsh (2002, #27) – Just 2 games in 2 seasons, de-listed in 2004. Tristan Cartledge (2002, #28) – Just 7 games in 6 seasons, de-listed in 2007. Kepler Bradley (2003, #6) – Just 49 games and 14 goals in 5 seasons. Highly over-rated player who’s now at Fremantle. Jay Nash (2003, #28) – Just 43 games in 7 seasons. Andrew Lee (2004, #30) – Just 5 games in 5 seasons. Paul Thomas (2004, #60) – 8 games, de-listed after a promising debut season. Austin Lucy (2005, #66) – Never played a game, de-listed after a few seasons. Tom Hislop (2006, #20) – Just 7 games in 2 seasons before being traded to Richmond. David Myers (2007, #6) – Just 20 games in his third season at the club after being taken at number 6. Time is quickly running out. The issue here is that these kids are showing promise at a young age, yet not developing into classy footballers. A look through the draft records show many of today’s best AFL players, all taken at later stages of their respective drafts. So in conclusion, who’s to blame for the current situation the Essendon Football Club finds itself in? Partly the coach for playing to a game style which will not work with the list of players he currently has available to him. He also needs to select the best 22 and give these kids a chance to live up to their potential. Dropping them after one or two chances will not do anything for their confidence and when they do get a chance to play, they’ll be so terrified of being dropped that nerves will simply get the better of them. Partly the players for under-performing. There are some exceptions, in particular Watson, Fletcher, Hocking, Monfries, Hille, Ryder, Dempsey and Stanton who are performing close to their potential and giving it 100%. There is however a long list of players who are terribly out of form or simply not good enough. Partly the recruitment and development staff for the poor results which has ended up seeing a dozen top 50 draft picks wasted in 7 years. More effort needs to be put into the recruitment and development process in order to ensure these talented kids become future champions. Firstly, Knights needs to change his approach if he wants to keep his job. The attacking needs to back off a bit as the turn-overs are costing us dearly. He also needs to persist with these kids and give them a decent chance before sending them back to Bendigo. If this doesn’t happen, there needs to be a change of coach, simple as that. Essendon missed their opportunity a few years ago with first Thompson, then Harvey and finally Hardwick. Three Essendon champions who are highly respected within the club and want it to succeed. Gary O’Donnell is a possible replacement. Secondly, the players need to be put on notice. If improvements aren’t made in the remainder of the season, then there needs to be a clear-out. Essendon is a proud club and will not accept mediocrity. Finally, there needs to be dramatic improvements in the development of these young players taken in future drafts. As previously mentioned there needs to me more effort put into the screening of potential draftees and once drafted, more effort needs to be put in to develop these fresh kids. The partnership with Bendigo also needs to be scrapped and Essendon (like Collingwood and Geelong) needs to go it alone in the VFL. Fingers crossed some of, if not most of this occurs and Essendon can return to the glory days of the early 2000’s. Essendon members are a bunch that demands success and if this continues, it’ll only get uglier.